Rotafix Rendacrete Industrial Floor Screed powder is a pre-mixed, ready to use, polymer modified cementitious floor screed. Rotafix Rendacrete Industrial Floor Screed contains a unique blend of special types of cement, graded silica sands, acrylic copolymer powders and a union of admixtures. Quickly and easily mixed, pumped, placed and finished. Fluid flow, self-smoothing, self-leveling, and will not segregate, bleed or dust. Can be applied to give a cover of 25mm down to a feather edge. Portland cement based, micro silica-enhanced, acrylic polymer resin modified, shrinkage compensated, fibre reinforced and self-curing. Quick strength for early trafficking, and high ultimate strength. Quick drying: solvent based resin toppings can be applied after a few hours. Strong bonding, wear resistant and durable to mechanical attack. Impermeable, waterproof and dense, and will resist corrosive chemicals. 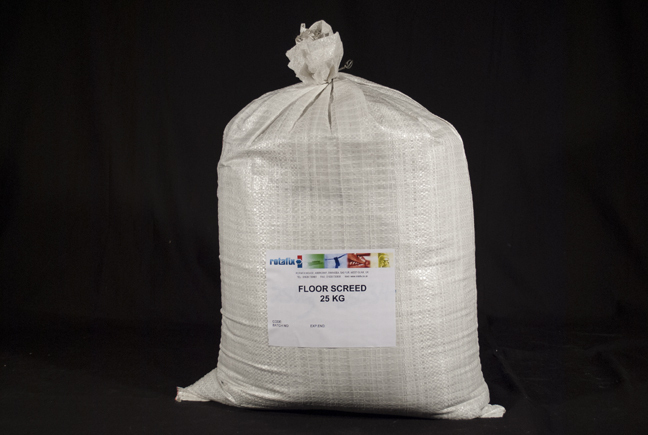 An alternative material to resin screeds, and cost-effective. High yielding, economical, non-flammable, non-toxic, odour free, user-friendly and safe to use. To cover concrete in workshops, warehouses, and factories with a thin section topping. To repair concrete floors, pathways, loading bays, car parks, and roads. To produce flat, level, smooth and attractive surfaces whenever required. To install anti-slip surfaces to concrete floors, paths, ramps, slopes and steps. 25Kg of Industrial floor screed yields 13.00 litres of the fluid screed.